Last year, after Apple announced that it would buy Beats Electronics, HP said that it would still use the Beats Audio brand until 2015. Now that we're in 2015 and HP can no longer use Beats technology, the company announced that it teamed up with Bang & Olufsen, making it its new audio partner. As you may know, HP used to include Beats Audio technology (as well as the Beats logo) on some of its Android tablets, or PCs. Founded 90 years ago, Bang & Olufsen is a Danish company with tradition in delivering high quality audio experiences. The company provides audio equipment for various important companies, including carmakers Audi and BMW. 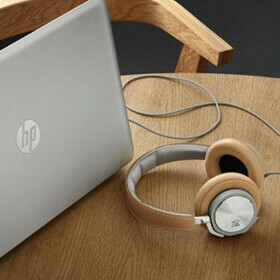 HP and Bang & Olufsen are planning to "custom tune each notebook, desktop, tablet and accessory for precise sound." Bang & Olufsen-branded HP devices will feature a custom audio control panel, and "a dedicated audio island" that protects "sensitive audio circuits from other signals on the motherboard." The first HP device to use Bang & Olufsen technology (and logos) is expected to be introduced this spring, and will be a PC. There's no word on when HP tablets with Bang & Olufsen audio will be released. I prefer klipsch, but b&o are still head and shoulders over the superhyped beats marketing machine. Anything is better than Beats. Wow, how has Apple avoided anti-trust, anti-competitive cases against them by screwing customers of its company purchases like Beats?? Surely someone has made some fuss over this?? Or is Apple immune to such behaviours? Well, its liek if you are leasing property from an owner. If the owner sells his property to someone else, the new owners are not legally bound to honor the old contract. Also, since Apple is a competitor to HP, HP likely doesn't want to pay Apple any money for the use of Beats. Because that was my beef. I like Beats, just not the price. It is way to excessive. But I purchased just one more pair off eBay and I won't be buying anymore. Tho I have been eyeing the wireless Beats Over-the Ear model for a while. I just don't want snApple to have my money. I am curious as to when Apple is going to drop Beats Audio into their Macs and phones and pads. That's a win for HP. Dropped that fancy looking Honda Civic for a Mercedes. People still use that crappy beats? This is good for HP. I didn't know Vertu used B&O sound technology until I clicked the link so they must have a good tracking record. Thanks PA, you made me browse B&O website. B&O has always been about design AND audio. They Are still very capable. I always liked B&O, but I always went with HK, Marantz, and MacIntosh. IIRC they were the originators of gesture based controls on their home stereo systems. I remember back in I believe 1987 my brother had a B&O preamp. It was a buttonless design, similar to a touchscreen but with a fixed layout. I remember it looked just like the control panels on Star Trek TNG. That was so cool back then. And this makes them pretty experienced in the area of making small but well sounding things - perfect for mobile. So who would you suggest is a good audio company? I like b&o no problems there but i don't think hp fits b&o as b&o is high class. if I'd choose speakers I'd go with b&w. But i have to add that i didn't focused on home speakers after 2009. The only speakers i checked out last year where the ss na of sony which i liked very much tbh. Gotcha, when I read it I thought you said HP and B&O weren't very good, I missed that it said Beats wasn't very good. While I agree, they aren't the worst either. I have an Asus G50VT laptop that has Altec Lansing speakers, and that is probably the worst laptop speakers I've ever heard. They're probably worse than the standard speakers that are offered, they're so quiet it's like they're using ear bud drivers. Which is surprising since most Altec stuff I've heard was great quality and performance. I had some HK internal speakers & sub on a Toshiba Qosmio that rocked, loud and clear. Ok. O have a hp laptop which also has altec speakers but those are pretty loud. I have to say that i have yet to find a laptop producing sound like my z3tc. But usually they just do the job don't. I don't use my laptops that often anymore. Most things are faster on phone or tablet. My laptop is my primary when I need to do things that are more problematic on mobile devices (video & photo editing). After I stopped using a desktop, I moved my speakers over to my laptop, a Logitech Z3 which is a pair of satellite speakers and a powered sub. My brother got a pair of Altec computer speakers and those weren't as good as my Logitechs. When I was talking about Altec's being good, I meant their home, car, and commercial sound offerings. I took a seminar with Ted Uzzle from Altec Lansing, and he taught us a lot about setting up sound systems in commercial spaces. And the gear they use in cinemas are some of the best I've heard outside of IMAX. I just haven't been impressed by any of their mobile offerings. But it's been a few years since I got that Asus laptop (got it when Vista launched), so it might be time to check them out again. Yes the logitech z3's are pretty good especially for computer speakers. I personally have never been impressed by any inbuilt speaker of a laptop. The first mobile that impressed me was the w995 not that its so great ofcourse but that it's so much better than other phones the play was also pretty good and the m7/m8/z2t/z3/z3tc are also impressive for mobiles. Photo editing is 1 of the very few things for what i use my laptop. I used to use it for everything now my mobile took allot over. Even some small editing of pictures i domon my mobile if it doesn't have to be precise like showing what has to be done and where. Agreed. It seems odd that laptop speakers can't get decent sound yet we have smartphones that can. With so much space to make use of decent speakers, there should be no reason for not having loud and good quality sound from a device that's almost 20 times the size. The only thing I like about Beats on my HP Envy is that the built-in speakers are MUCH louder using Beats drivers than the stock Microsoft ones. The second you plug headphones or an audio cable in though, the sound is crap, constantly fluctuating in volume, and nothing you do with the audio control center can change that. Beats are reason #2 why I'm looking to replace my 7 month old laptop. It sounds like B&O is going to be a lot better thankfully. guys shall i go wth HP paring with beats r either HP paring with B&O laptop?!?? reply me fast dudes !!! !